Accomplish by deductive or inductive reasoning. Measures 2" up to 3-3/4"
Creating flags with a basic needlepoint stitch can be accomplished by deductive or inductive reasoning. Portable and completed in 1.5 hours. 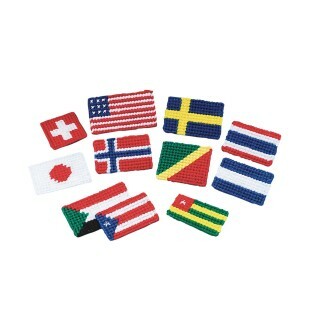 Includes plastic canvas, yarn, embroidery floss, steel yarn needles and magnetic tape. Scissors sold separately. 2" up to 3-3/4". Pack of 20. Level 4.6-5.8.